The exhibition Symbols and Traditions is timed to the 50th anniversary of the master of arts and crafts, a member of the Union of Artists of Russia, Rinat Akhmetov. Rinat Khametlatifovich Akhmetov was born on December 8, 1968 in the city of Kazan. In 1989, he graduated from the Kazan Art College with a degree in graphic design. Since 1997 he has been working in the workshops of the Union of Artists of the Republic of Tatarstan. From 2012, he became interested in arts and crafts, began to work in the technique of artistic wood carving and metal. The exhibition, which opens in Khazine, presents works created by the author over the past five years. These are large-scale panels “Tugan Avylym”, “Sabantuy”, “Letters”, “Sport”, as well as jewelry: “Myths of Ancient Bulgaria”, “Spring. Maslenitsa, Umai. 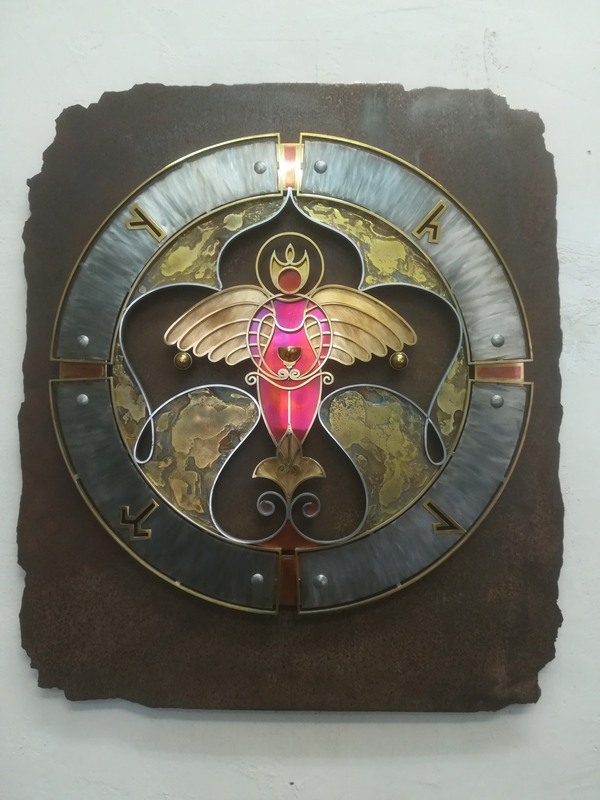 In 2017, Rinat Akhmetov won the prestigious Baki Urmanche Prestigious Annual Award of the Ministry of Culture of the Republic of Tatarstan in the field of fine arts, decorative and applied art and art history in the nomination "Decorative Art", in 2018 received a diploma for the jewelry set "Spring." Maslenitsa ”in the nomination“ The Artistic Heritage of Russia ”in the Fourth All-Russian Competition of Author’s Jewelry and Stone-Cutting Art in Kaliningrad. Rinat Akhmetov is a professional artist, masterfully mastering the new methods of metal processing, subtly feeling the beauty of his color nuances. Using original methods of finishing, the artist in his works reveals the artistic and decorative qualities of the material. Referring to the national ancient forms and ornaments, Rinat Akhmetov deeply comprehends traditional motifs and, skillfully stylizing them, gives them a modern meaning. His works amaze with the integrity of simple and clear forms, united by the richness of ornamental motifs, which involuntarily refers us to the art of the ancient masters, who organically felt the connection between the subject and the decor. The exhibition "Symbols and traditions", opening in the gallery "Hazine" on January 24, will last until February 24, 2019.